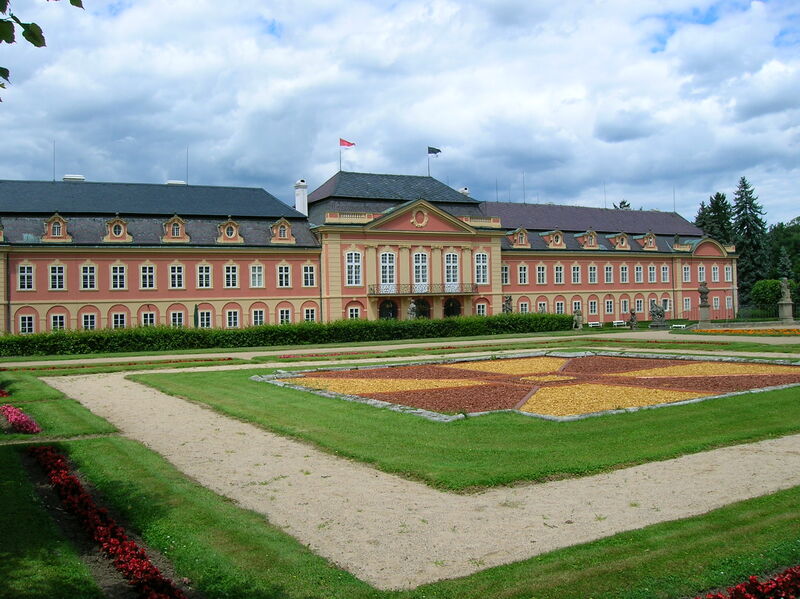 I loved the cheerful red and yellow façade of this charming chateau only a half hour from Prague. The captivating exterior always put me in a good mood. The short bus ride had taken me into a different and exciting world. 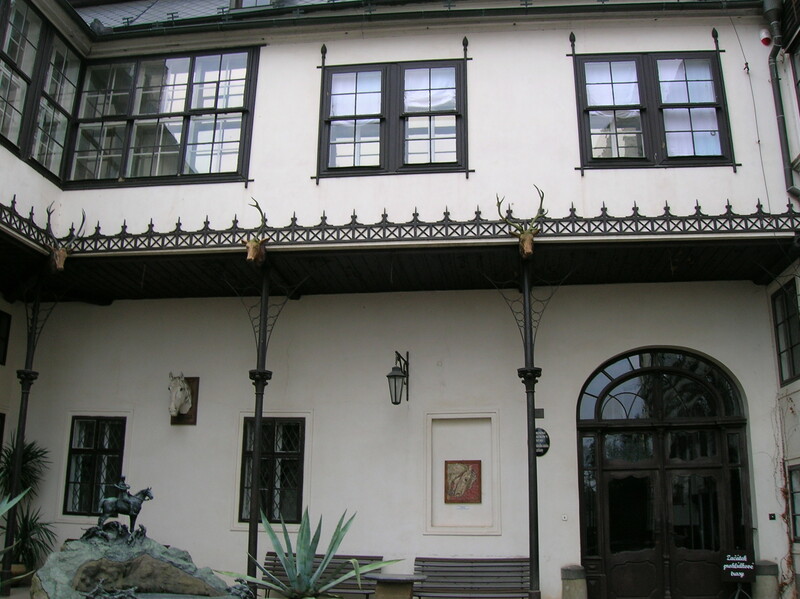 Because it was my third visit to Dobříš, I was well aware of its history. 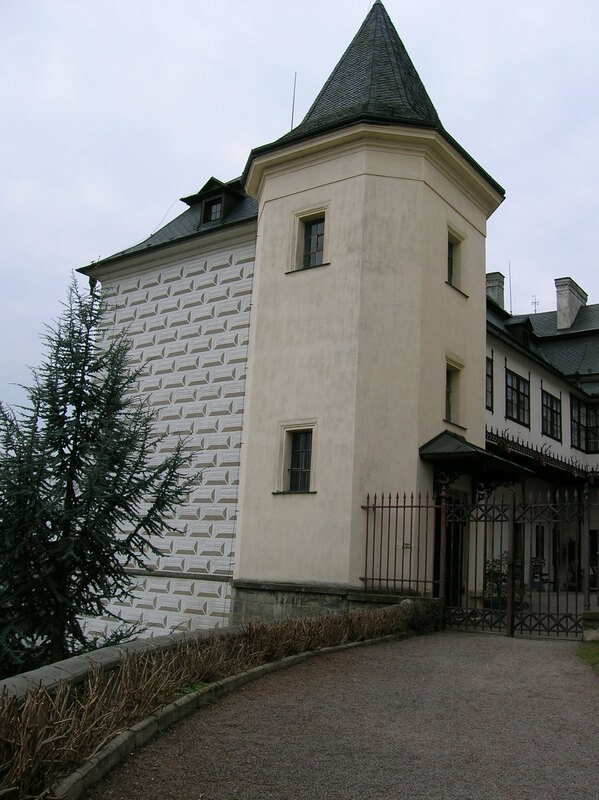 Unlike many other chateaus, Dobříš did not emerge as a Gothic castle or medieval fortress. 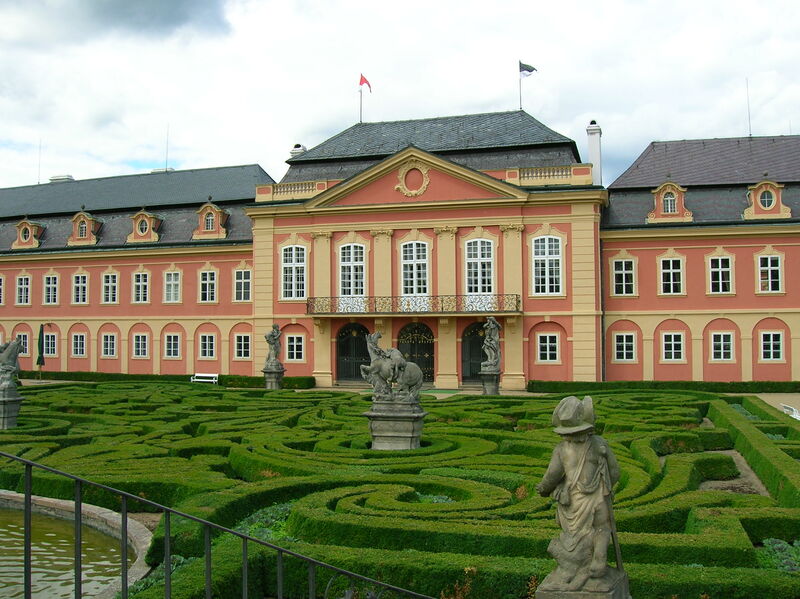 It was built as a Renaissance chateau at the end of the 16th century when travelers stopped in the town on their way from Prague to Italy. 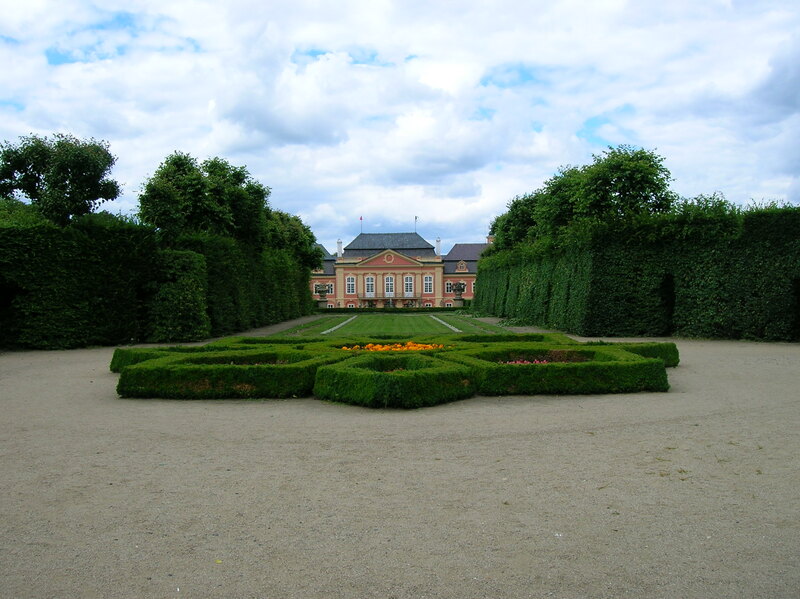 The chateau was purchased by royal hunter Bruno Mannsfeld in 1630, beginning its long ties to that clan. 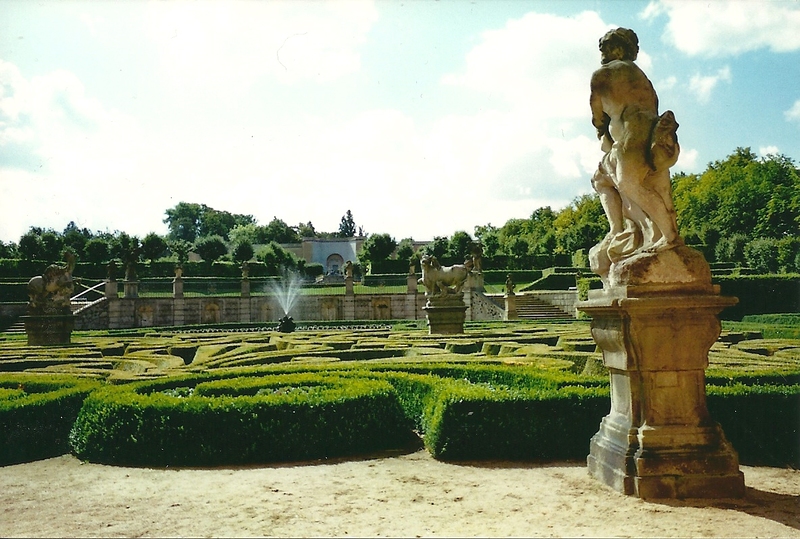 It got a Baroque makeover at the end of the 17th century, when its lush French and English gardens came into being. 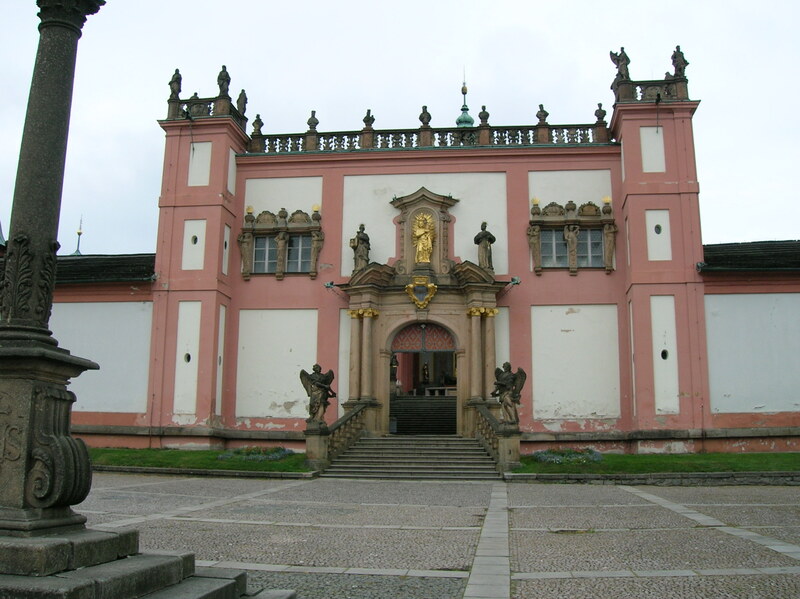 Although a fire devastated the chateau in 1720, the Baroque jewel was reconstructed by 1765. 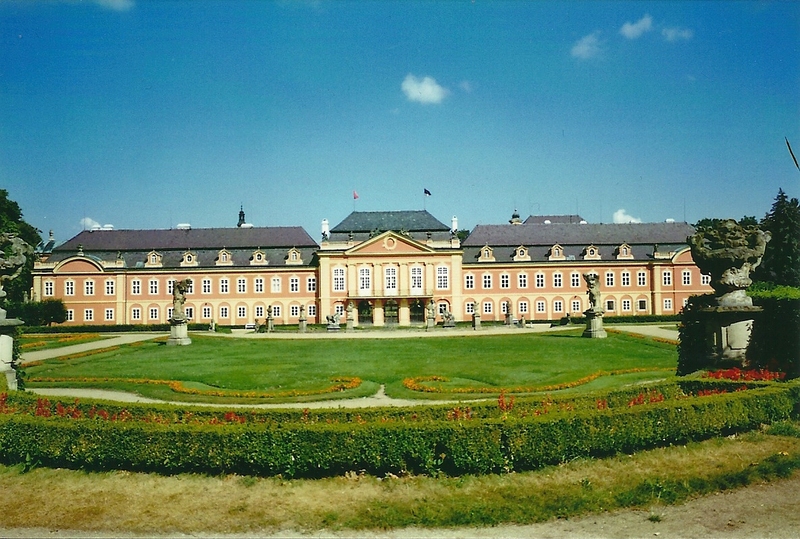 The Colloredo family came into the picture when Marie Isabella, the daughter of Jindřich Pavel Mannsfeld, married František Gundakar Colloredo in 1771, and the new name of the owners became Colloredo-Mannsfeld. World War II brought dark days to the chateau. 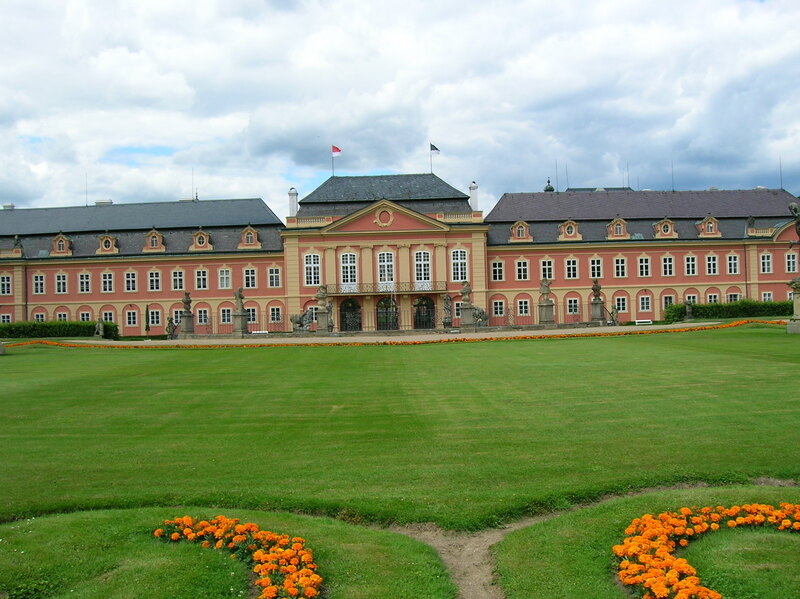 In 1942 Dobříš was confiscated by the Nazis and served as the seat of acting Protector of the Reich Kurt Daluage, who succeeded the assassinated Reinhard Heydrich that same year. Vikard Colloredo-Mannsfeld, the owner of the chateau during this turbulent time, refused to become a German citizen, taking a stance against the Nazis and targeted as an enemy of the Reich. In 1945 the chateau was taken over by the state and became the property of the Writers’ Syndicate. As the Writers’ Home from the 1950s to 1990s, the chateau housed scribblers for stays that lasted a week or months. Writers’ conferences were held here, too. A stormy legal battle began in 1992 when Jerome Colloredo-Mannsfeld wanted the chateau and both parks returned. Six years later he got his wish, but he died that same year. Now his descendent, also Jerome Colloredo-Mannsfeld, owns the chateau. Both representative rooms and former guest rooms make up the 11 spaces on the tour that lasted an hour and depicted the chateau during the Rococo and Classicist eras. This time I had my own guide, which is the way I preferred to see the interiors. We began in the Salla Terrena where the glazed doors once served as an entrance to the stunning French garden I loved so much. Both the captivating statues in the room and those in the park were the work of legendary 18th century Czech sculptor František Ignác Platzer, who also designed the statue of Saint Norbert on the Charles Bridge and the ornamentation of Saint Nicholas Church in Prague’s Lesser Quarter. The walls of this space were decorated with hunting scenes. The Hunting Lounge featured 18th century wallpaper with hunting motifs. Admiring the hand-painted décor, I spotted three hunters relaxing in lush scenery, accompanied by a dog. I took note of the mixture of Classicist, Rococo and Louis XVI styles evident in the pieces of furniture. I found it intriguing that the legs of a chair fit into the Rococo style while the top part exuded Classicism. The exquisite chandelier hailed from Murano. Photos of the chateau from 1910 appeared throughout the rooms. The Master Bedrooms were next. Although the furniture flaunted Classicist style, the desk in the space was Baroque. I was particularly drawn to the 18th century armchair upholstered with Gobelin tapestry that showed Venus coming out the sea as she was born. I also adored the gilt Japanese vase that depicted scenes from the life of Buddha. The oldest picture in the chateau, dating from the 16th century, showed Saint Jerome with a skull. The guide explained that St. Jerome was the patron saint of the Colloredo-Mannsfelds. Weird pictures on the drawer of an 18th century ebony bureau depicted angels with instruments of torture. The picture on an easel in the Italian Lounge was called Canal Grande an original rendition by 18th century Venetian painter and printmaker Canaletto. I thought back to my short trip to Venice five years ago and recalled how I was bursting with energy each day. I wish I had that much energy now. How I had loved meandering down the deserted streets on a Sunday at 7 am! That was when I became hooked on cappuccino. There were other paintings of Venice in the room, too, as I spotted a gondola and a carnival in full swing. Views of Naples and Messina also adorned the space. A Classicist screen held a compartment for letters. The 50-kilogram chandelier hailing from Murano was light blue and white with floral ornamentation. I loved Italian chandeliers. The tan furniture with black stripes fell into the Classicist category. I tried to imagine an afternoon tea party in the Ladies’ Rocco Lounge with women relaxing on the maroon Rococo seats and sipping tea from Meissen porcelain cups while recounting anecdotes, telling jokes and complaining about their husbands. A display case with Dresden porcelain had a unique shape – it looked like a carriage. I imagined all the conversations that must have taken place under the Bohemian crystal chandelier hailing from the days of Holy Roman Empress Maria Theresa. Paintings of pastoral scenes rounded out the attractive room. The first thing I noticed in the Ladies’ Bedroom was that the white bed with shell ornamentation looked too short, but I knew from other tours that people used to sleep sitting up or half-sitting. They were afraid they would die if they lay down, or women did not want to mess up their elaborate hairstyles. I was surprised to hear that the bed is actually two meters long. Ludwig XVI style furniture, harkening back to the 18th century, was featured in this opulent décor. A copy of Raphael’s Madonna hung in the room. The guide told me a legend about the Venetian mirror: People who look into it will have their wishes fulfilled as long as they do not gaze into another mirror for a year. The next room was totally different, seemingly from another world. This Writer’s Room was decorated the way the room would have looked when the chateau belonged to the Writers’ Union, from the 1950s to the 1990s. The space featured a modern bed, a typewriter, a record player and a modern bathroom with two tubs. The corridor in the chateau was home to intriguing, 18th century pictures of Prague and Vienna. I spotted graphics of Schönbrunn Palace and its surroundings plus a forest with a church and a pond. In the section focusing on Prague I recognized Old Town Square with a plague column in the center and Týn Church’s spires in the background. Measuring 220 square meters, the Hall of Mirrors was the largest room on the tour. It was also the most astounding. It was often used for weddings and concerts, and I recalled attending a concert here in the early 1990s when the chateau’s rooms were not open to the public. Certainly this fresco-filled hall was suitable for weddings with its stucco ceiling décor and other ornamentation dating back to the 18th century. Craning my neck to see the ceiling fresco, I peered at a blue sky with angels fluttering to and fro. 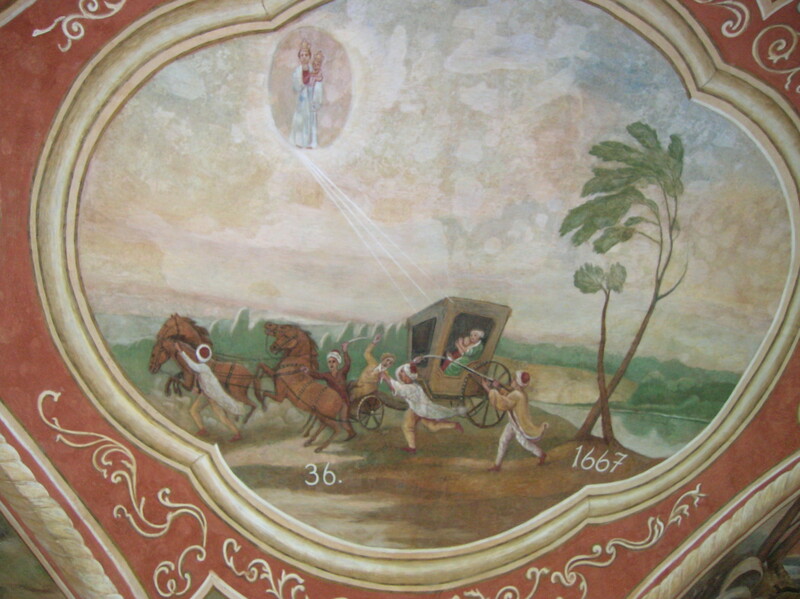 Allegories of the four seasons were painted above the door. The frescoes above the balcony represented the five senses. Eight Venetian chandeliers captured my attention. Two marble fireplaces on opposite sides of the room and two Czech crystal chandeliers added to the room’s opulence. Above one fireplace, Josefína Czernínová held a small dog in one hand. Opposite her, Jindřich Pavel Mannsfeld gripped construction plans in his right hand. The Gobelin tapestry room charmed me with its tapestry upholstery on the furniture. I noted the armrests portraying scenes from Italian commedia dell’ arte performances. I especially admired the semi-precious stones in the 18th century jewel chest made of black ebony. In a portrait Marie Isabella Mannsfeld wore an attractive pink dress and had her hair up in a bob. Vases with Oriental motifs were also enticing. The Rococo Room or Music Room featured Rococo stucco wall décor. Vases dotted the room – some Japanese and others made of Viennese porcelain and sporting floral designs. I took special note of the four Venetian mirrors with gold frames. I loved Venetian mirrors despite their opulence! Above a dominating marble fireplace, a portrait of Joseph II showed the distinguished Holy Roman Emperor with one hand on his hip. Two Czech crystal chandeliers added to the noble atmosphere. An aquarium was unique. The big bowl showed off designs of orange fish and flowers. The oldest book in the library was open on the table – a German Bible from the 16th century. I admired its bewitching Gothic script. The 3,600 books on the dark wooden shelves were written in German, English and French with a few in Czech, and most hailed from the 18th and 19th centuries. 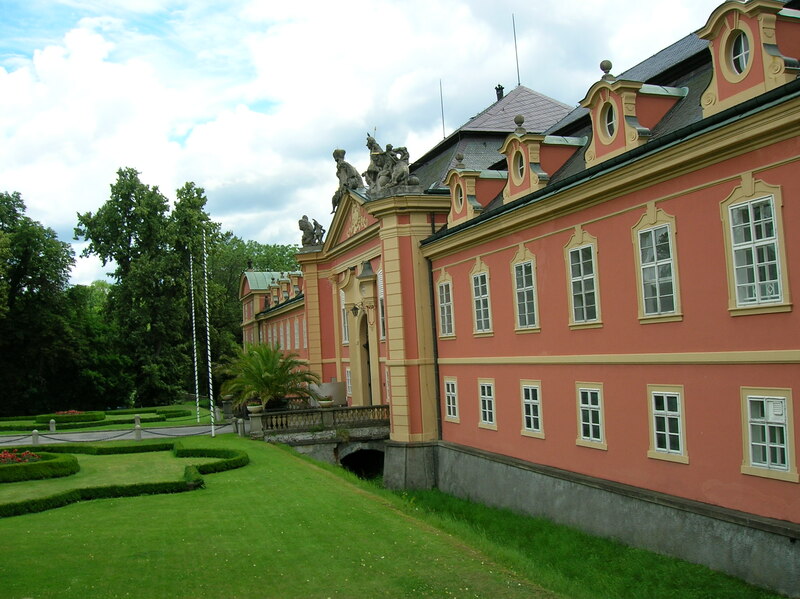 The collection included the volumes of the History of the Czech Nation in Bohemia and Moravia by legendary Czech 19th century historian, František Palacký. Other valuable items were many books by Alexandre Dumas as well as the Encyclopedia Brittanica. Portraits of the Mannsfelds and Colloredos also adorned the room. I recognized one painting as a copy of the original I had seen in the Prado – Diego Velázquez’s “Portrait of the Spanish Infanta Margarita Teresa.” Dolls had been placed throughout the rooms as part of a special exhibition, and in this space there were 50 doll figures from novels. Madame Bovary made a memorable appearance. The Dining Room boasted of 20th century Neo-Renaissance traits. The 12 chairs made of leather had armrests sporting the eagle on the coat-of-arms of the Colloredo family. 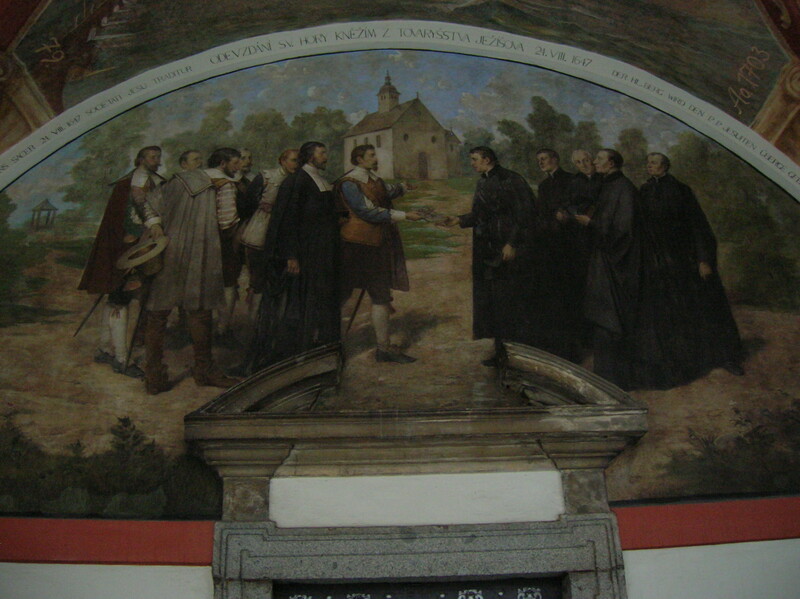 Portraits of the Colloredo-Mannsfelds also decorated the walls. In one portrait Josef Colloredo-Mannsfeld was seated on a red chair, with books on a nearby table, perhaps symbolizing his vast knowledge obtained while he had traveled around the world. The vases from Delft added ambience as did the stucco décor on the ceiling. After touring the 11 rooms, I paid a visit to the JCM family Gallery. Family portraits and Baroque 17th and 18th century works by Italian painters dotted the walls of the small, intimate spaces. I noticed many biblical and mythological scenes as well as historical themes and landscapes. Salvatore Rosa executed “Saint Peter Fishing” in the 17th century while a portrait of Holy Roman Emperor Leopold II hailed from the end of the 18th century. Other works addressed topics such as the judgment of Paris and the murder of Saint Wenceslas. Leonardo Bassano’s depiction of the Last Supper from 1605 graced a wall, too. A temporary exhibition in the gallery featured the work of Belorussian painter Alexandr Iljuščenko. I admired one modern landscape with many greens and browns and his depiction of a tram over a bridge. I could almost hear it clattering over the tracks. An alley flanked by trees during the fall also caught my attention. In another work I saw a green pasture and hills. The people rendered in the paintings appeared too modern for me and took something away from the magical atmosphere of the scenery. Next I walked into the bewitching French park of nearly two hectares. It was one of my favorites. 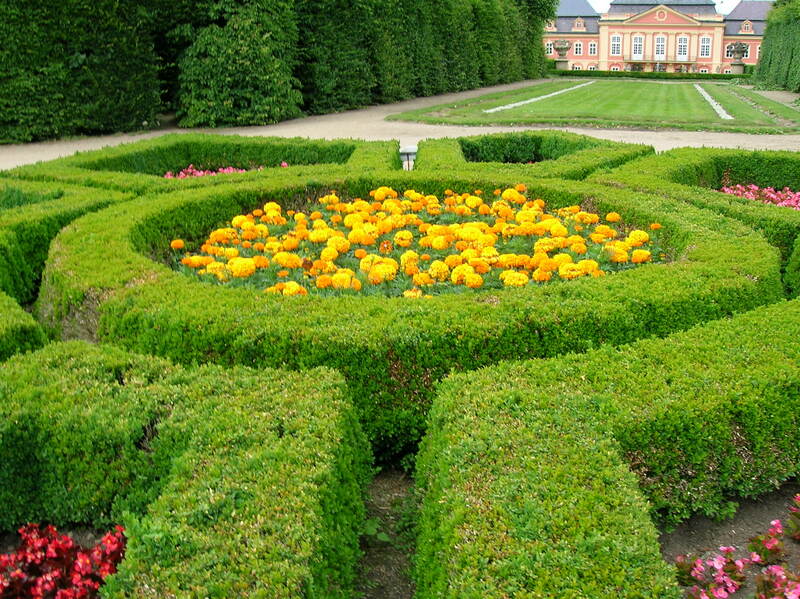 Founded during the 1770s when the chateau got a Baroque makeover, the French park now boasts of Rococo style. 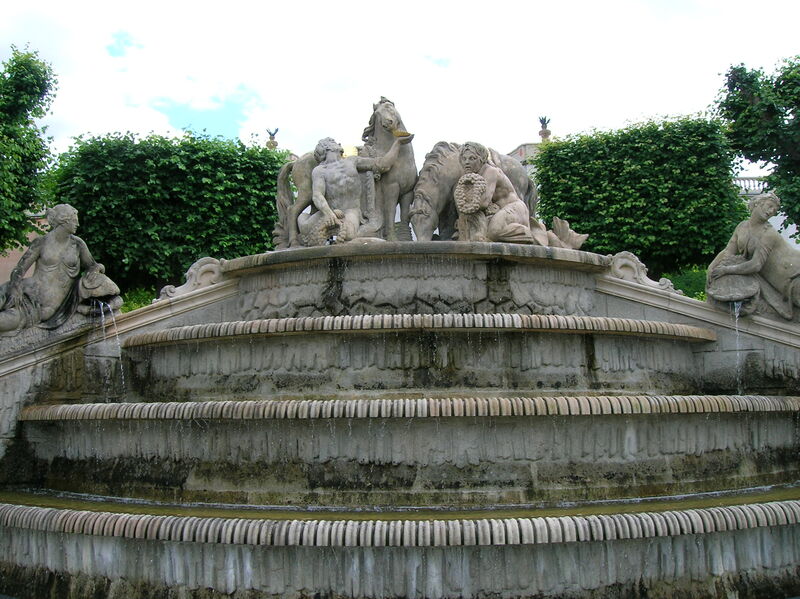 Five terraces, an orangery and a fountain with a Baroque sculptural grouping of horses created by Platzer around 1760 were just a few of the pluses. I also viewed allegorical statues of the seasons. I spotted Poseidon with a crown and Nares with an oar and ocean wreath, too. In the orangery I took note of the four statues of figures from mythology, including Apollo and Aphrodite. 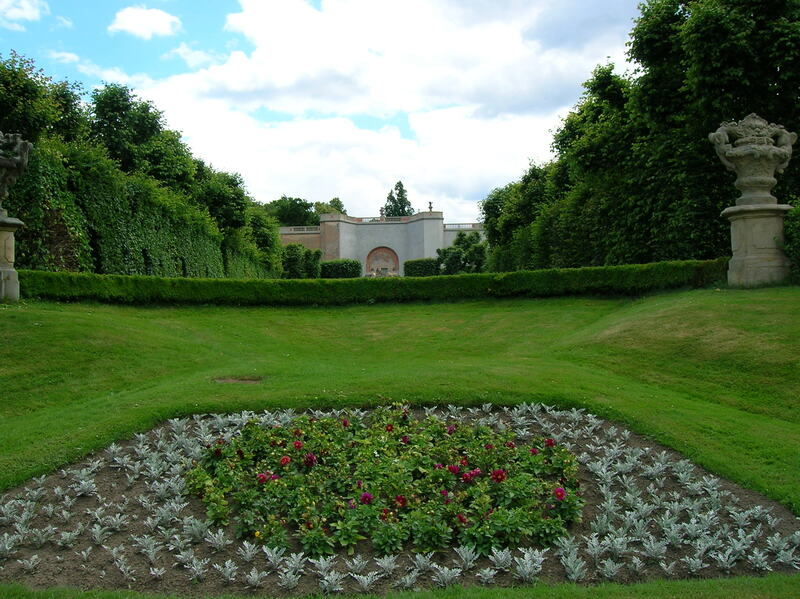 The English park was much larger, spanning 30 hectares with a pond and stream. Three artificial caves were located here as well. I had an appetizing lunch of chicken on a skewer in the quaint and busy chateau restaurant and then made my way to the nearby bus stop for the half hour ride back to Prague. The bus from Prague to the central Bohemian town of Příbram, 54 kilometers southwest of the capital, took about an hour. 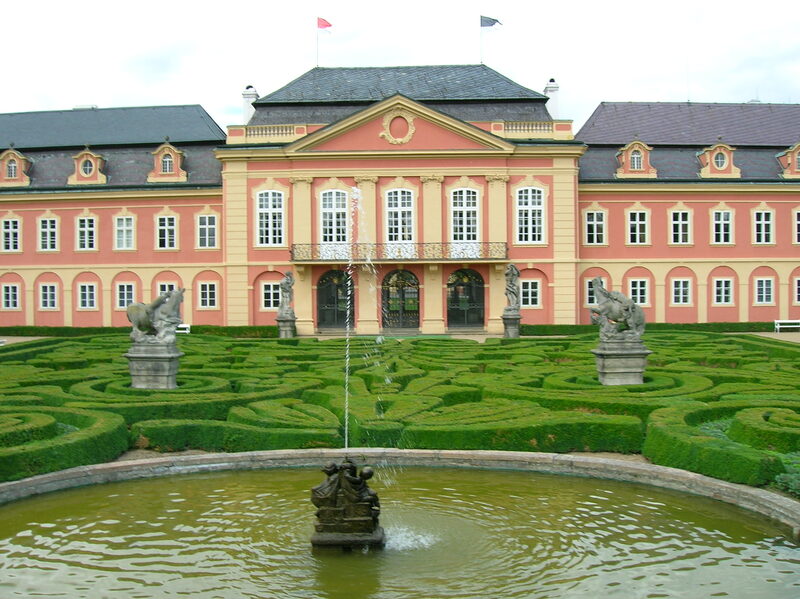 When it made a stop on the main square in Dobříš, I remembered visiting that lovely chateau with the quaint restaurant in its courtyard. I got off in Příbram and walked uphill for a while until I reached the Holy Mountain (Svatá Hora) pilgrimage site, a former Baroque monastery complex that included ambulatories, open altars, closed corner chapels and a basilica with three open altars on its loggia. On the bus I read some historical information about the place to which the devout had been flocking for centuries. According to one legend, the original chapel was constructed courtesy of Knight Malovec in 1261 as his way of showing thanks to the Virgin Mary, who had protected him from robbers at the site. 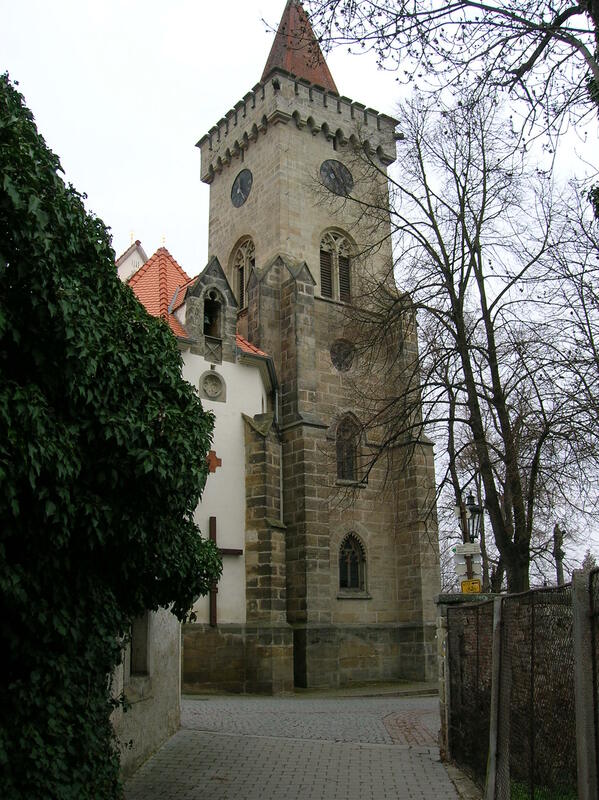 Another legend claims that the first Archbishop Arnošt of Pardubice, had the chapel erected during his tenure in that function from 1344 to 1364. (The first Archbishop also had been an active diplomat during Emperor Charles IV’s reign.) Some speculate that the original chapel may have been built in the 15th century or at the beginning of the 16th century. The statuette of the Holy Virgin, now placed in front of the silver main altar of the basilica, is Bohemian, from the Gothic period, probably created in the 14th century. Pilgrims had begun traveling from afar to see the Madonna in the first half of the 16th century. The figurine was hidden in the tunnels of mines and other places during the Hussite wars of the 15th century and then returned to Holy Mountain, which witnessed dismal days again during the pillaging and destruction of the Thirty Years’ War in the 17th century. During those battle-ridden times, the statuette had been transported from place to place again. The chapel had even been used as a stable when the Emperor’s troops took over Holy Mountain. The blind beggar Jan Procházka dreamed of regaining his sight at Holy Mountain in 1632, and his dream came true. The popularity of Holy Mountain soared, major repairs were made and even Emperor Ferdinand II paid homage there on several occasions. 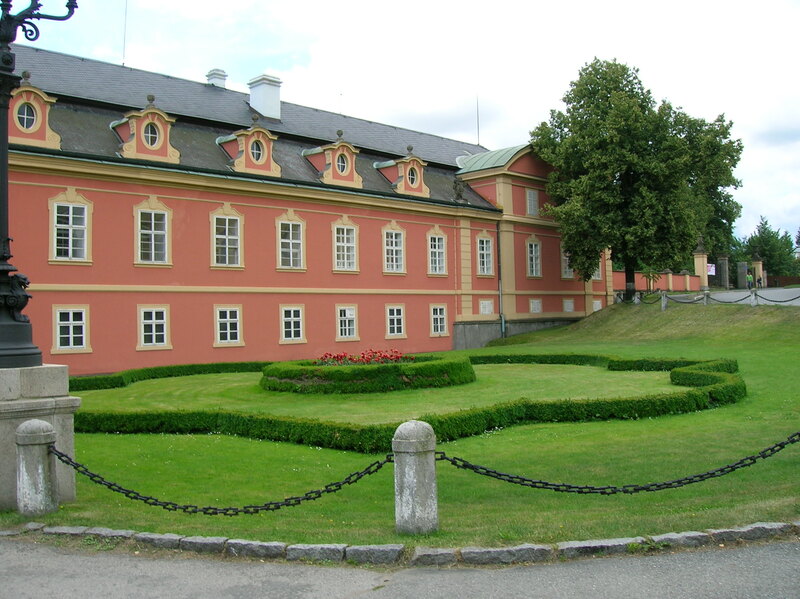 After the Jesuits took control of Holy Mountain in 1647, the Baroque complex was built. Chapels and ambulatories were erected, and the place was decorated with stucco and paintings. In 1732 the statuette was allowed to don a crown made of gold, as one of the Virgin’s titles is Regina Coeli, Queen of Heaven. In 1773 the Jesuit Order was abolished because European leaders felt threatened it, and Pope Clement XIV succumbed to the secular demands. The Order only carried on in Prussia and Russia. In other countries it was suppressed for 40 years. In 1773 the state took over Holy Mountain. The site became dilapidated. The Redemptorists came into the picture during 1861. 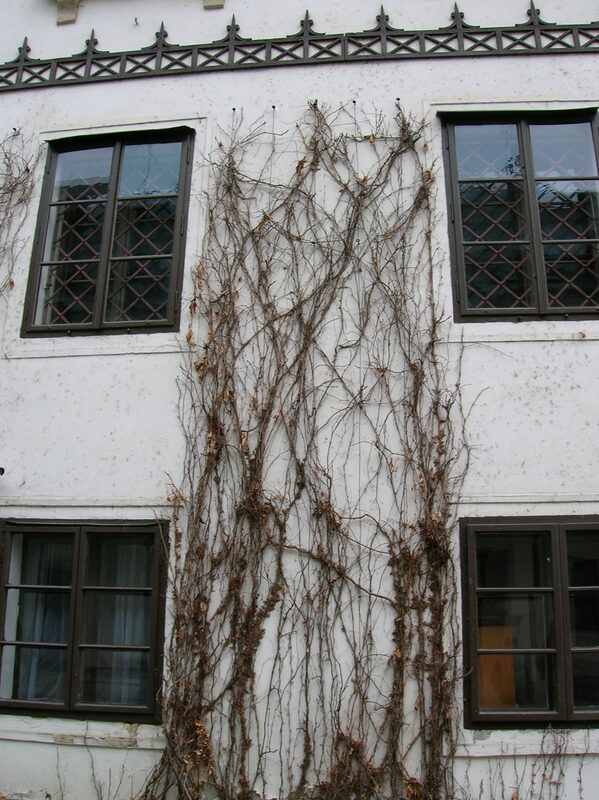 Extensive restoration was carried out in the early 20th century. Pope Saint Pius X raised the status of the church to a basilica in 1905. 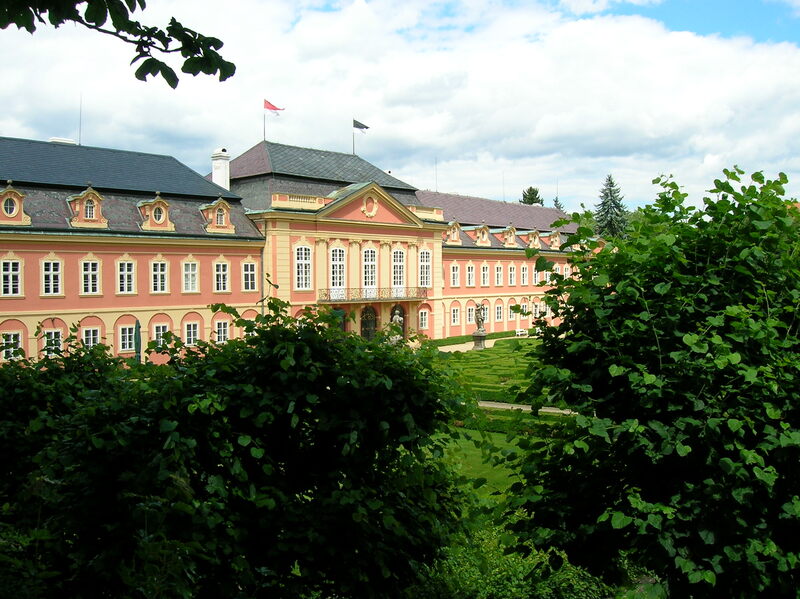 After Czechoslovakia was created in 1918, Holy Mountain continued to be a favorite pilgrimage site. But Holy Mountain once again faced difficult times during the Occupation and Communism. 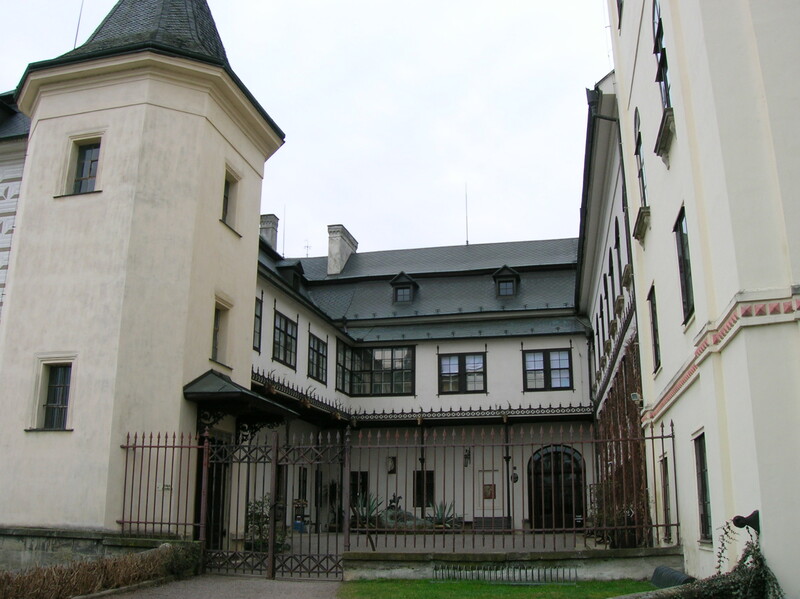 Under the Nazi regime the Redemptorists had been allowed to carry out a limited number of activities, but in 1950, during the Communist era, the Redemptorists were expelled from the site. On April 13, 1950 the Communists closed down all the monasteries in the country and transported the monks and friars to internment camps or put them in prison. Still, that did not stop the devout from making the arduous journeys to the complex. Then, in April of 1978, a fire destroyed part of the site. The police claimed some mischievous children had accidently started the blaze. When the complex was returned to the Redemptorists in 1990, extensive reconstruction took place. Now there are six priests who take care of Holy Mountain. As I approached the Holy Mountain complex of buildings, I noticed how austere the exterior looked. I stopped in front of the main gate, called the Prague Gate, which was created in the early 18th century in collaboration with the legendary architect Kryštof Dientzenhofer. The statuary adorning the gate was spectacular. Seven statues of prophets from the Old Testament and seven busts of saints decorated the balustrade. I spotted Saint Wenceslas, the Czech patron saint, and Saint George, among others. The basilica was situated on a terrace in the middle of the courtyard. 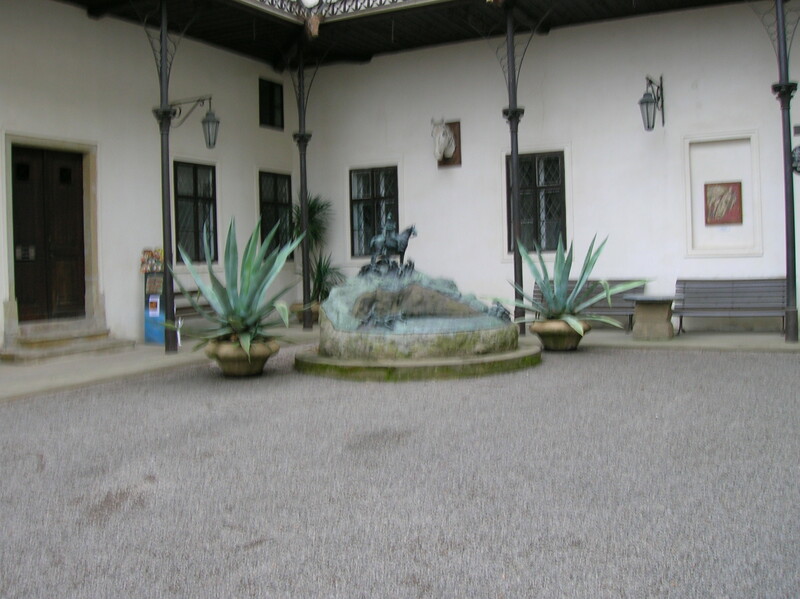 The terrace was decorated with spectacular statuary. Surrounding the basilica were ambulatories with 16 arcades and four closed, corner chapels. Many open chapels adorned the ambulatories that also featured 21 lunette paintings focusing on the legends and history of Holy Mountain. 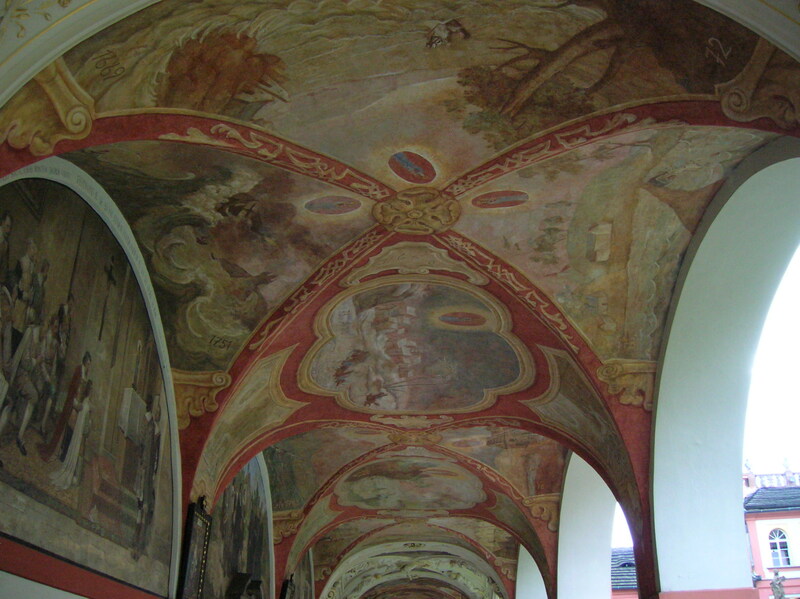 The 100 paintings on the vaults of the ambulatories portrayed tragedies in which the Holy Virgin of Holy Mountain saved the believers in acts of miracles and grace. One ambulatory featured falling from a tower and falling from a horse, for instance. Other vault decoration portrayed the dangers of the plague, fire and lightning. Catastrophes triggered by water were also represented. The stucco work on the ambulatory chapels was original, though the altar paintings were redone by Jan Umlouf during the late 19th century. The first closed chapel that we came to was the Prague Chapel, named after the capital city because the Old Town, the New Town and the Lesser Quarter of Prague had contributed funds to have it built. The coats-of-arms from these towns prominently decorated the chapel that harkened back to the late 17th century and early 18th century. The exquisite stucco decoration enthralled me as did the eight paintings of saints on the ceiling, but what really got my attention was the painting decorating the main altar. It had been created by my favorite Czech Baroque artist, Petr Brandl. I loved the detail of the fluttering angel clad in dynamic drapery in Brandl’s energetic work, “The Annunciation of the Virgin Mary.” The angel’s gaze at the Virgin Mary appeared so protective, yet so fragile. The cupola featured portrayals of eight Czech saints with Saint Wenceslas and Saint Ludmila among them. On one wall I saw a painting of the Saints Cyril and Methodius, Byzantine Greek brothers, who, during the 9th century, introduced the Slavic language to the area that is now the Czech Republic and other regions. I also admired the stucco decoration with garlands and putti. I explored the open chapels. The Nativity of the Virgin Mary Chapel hailed from the 17th century, with a painting on that theme in the center of the altar. Saint Catherine and Saint Wenceslas fIanked the main altar. I liked the appearance of the spiraling columns at the sides of the central panel and the white stucco on the ceiling adorned with exquisite, small paintings. I also studied a painting of a pilgrimage from Prague to Příbram, a journey which had taken three days during the 17th century. I recognized Prague Castle and the Charles Bridge in the background. Those were two sights I rarely visited these days but adored despite the never-ending flow of tourists. The Triumphant Virgin Mary Chapel from 1674 was certainly unique. General and Count Jan (Johann) von Sporck had it decorated with symbols of war, such as weaponry. A general of the Habsburg armies famous for his successes during the Thirty Years’ War of the 17th century, Sporck had certainly proved himself as a military leader, but he was also known for his avarice and cruelty. Serfs disliked him so much that they were convinced he knew witchcraft and had ties with the Devil. His son Count Frantíšek Antonín von Sporck was well-respected for his patronage of the arts. On the altar Jan von Sporck emphasized the theme of war to the extreme. The paintings featured battles showing the defeated Turks. The central panel featured a soldier wielding a sword and shield showing the head of a Turk. White with gold stucco decoration included a child fighter armed with a sword in one hand and the head of a Turk in the other. I found the war themes appalling, especially the depiction of the child as a soldier holding a severed head. Seeing the altar made me think about all the wars in which the United States had been embroiled during recent years. I have always been against the war with Iraq. I remember watching the beginning of the Iraq war unfold on CNN through the early morning hours, my gaze glued to the battles on the screen, horrified by what I saw, yet unable to turn away. It made me feel sick to my stomach. I did not think that the USA should get involved in Syria’s conflict, though the situation was far from simple. I wondered if there would ever be a time again when the USA would not be at war and if I would be alive to see America at peace. The open chapel showing the engagement of the Virgin Mary to Saint Joseph portrayed the Holy Virgin receiving Saint Joseph’s ring in the central panel. Landscapes adorned with stucco were featured on the walls. Landscape depictions during the Baroque period were rare, the guide told me. We also passed musical instruments made of stucco, the violins and trumpets getting most of my attention. 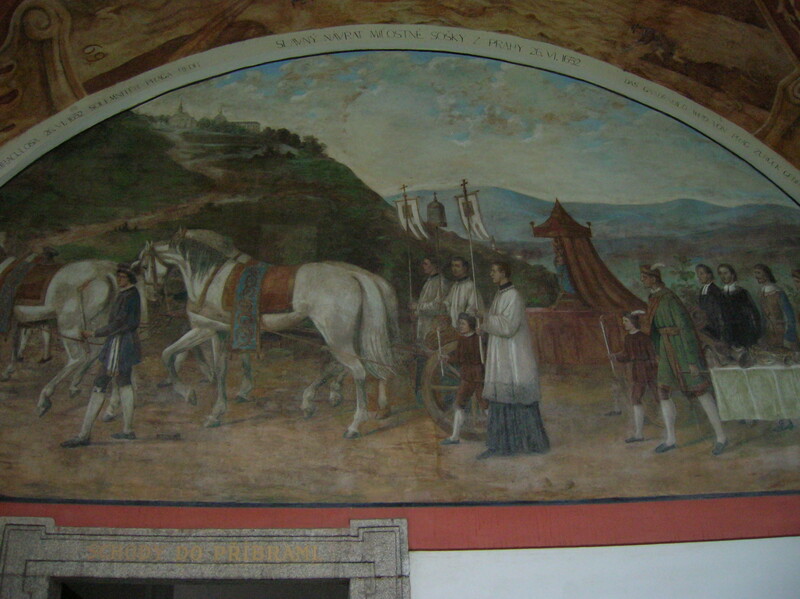 Another painting showed a procession of pilgrims with children approaching Holy Mountain. The closed Březnice Chapel hailed from 1665. The stucco work was impressive. I gazed at the ceiling paintings, showing the flight into Egypt, the burial of Christ, soldiers guarding Christ’s Tomb and other scenes. I wondered who had painted them – the artist was unknown. I noticed skulls decorating a column of another open altar. Scenes from Hell and sudden death were depicted on the vaults of the ceiling and walls. 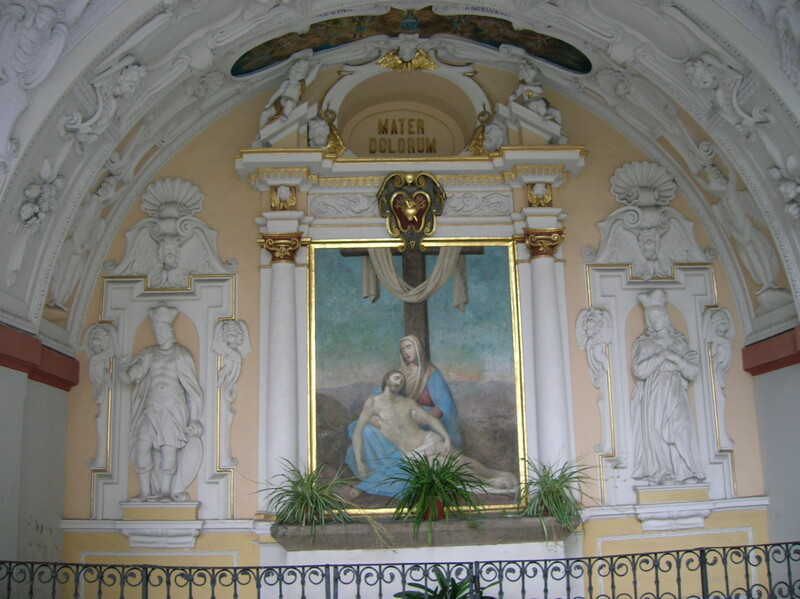 Another chapel featured the death of the Virgin Mary surrounded by paintings of the 12 apostles on the wall and ceiling. Then we came to a closed, corner chapel named after the west Bohemian town of Pilsen. 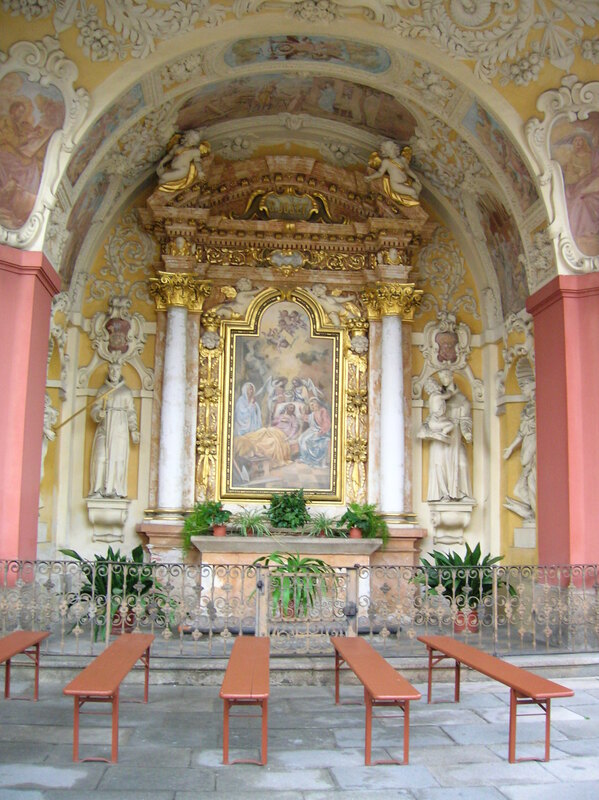 The main altar featured a painting of the patron saint of Pilsen, Saint Bartholomew, holding a book. The Virgin Mary of Pilsen and Saint Michael also made appearances. I noticed that Saint Nicholas was clad in elegant, golden robes. Angels accompanied the saints, playing various instruments. I also noticed the exquisite carvings on the benches. Next we went outside the ambulatories and down to the Chapel of Mary Magdalene, which looked like a cave thanks to artificial stalactites, created in 1665. A statue of Saint Mary Magdalene, who, according to a medieval legend, had lived in a cave for 30 years after Christ’s resurrection, made up the main altar while scenes from her life were painted on the cupola. Figures of other saints surrounded her. The effect of the cave-like room was eerie and creepy, but stunning all the same. I had never seen anything like it except for a church in a cave in Palermo, Sicily. Outside the guide pointed out one of the 12 crosses on the Stations of the Cross that the devout could follow, saying prayers at each station, symbolically following in the footsteps of Christ to the Cross. Don’t let me forget the closed chapel called Mníšek. It dated from the late 17th century and early 18th century. 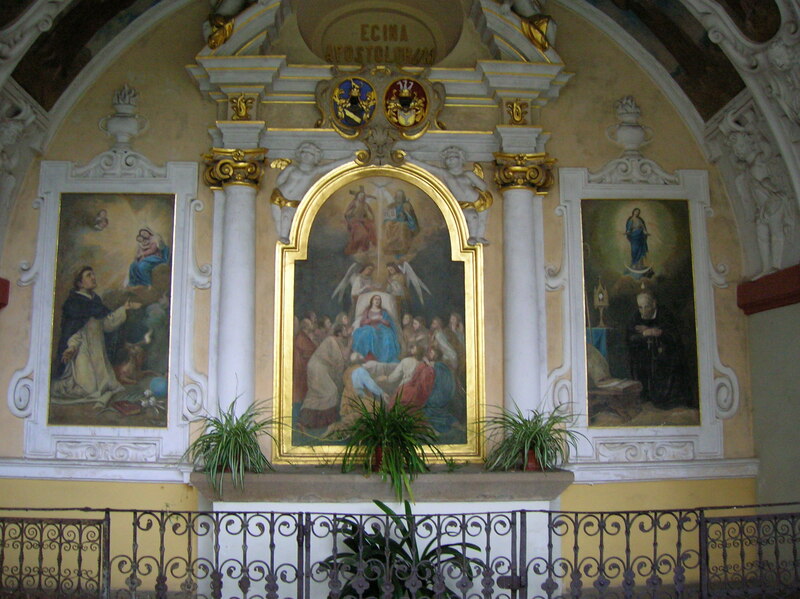 Its altar painting showed Saint John of Nepomuk kneeling before the Virgin Mary and hailed from 1871. 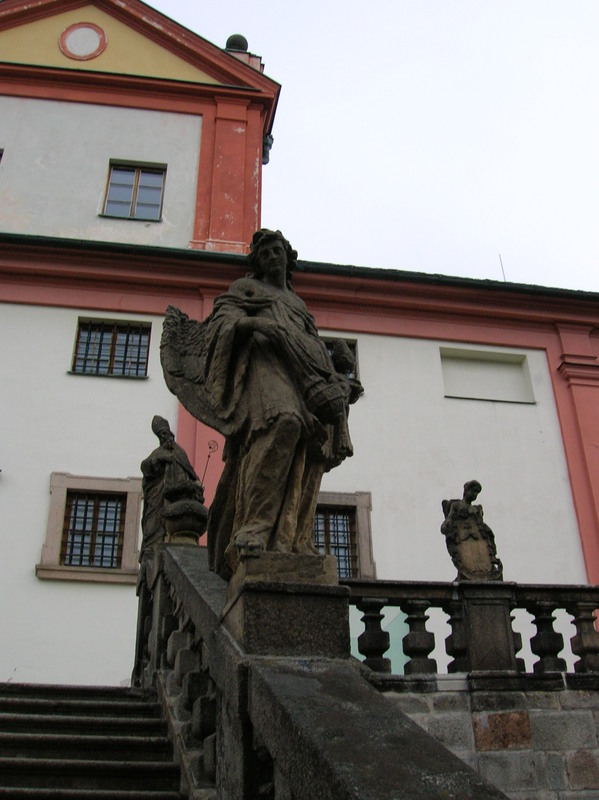 Statues on the balustrades of the chapel featured saints and angels. We continued to the basilica in the middle of the courtyard. I admired its balustrade with impressive statues of Bohemian patron saints and angels. There were three open chapels in the loggia. I liked the Coronation Chapel the best. 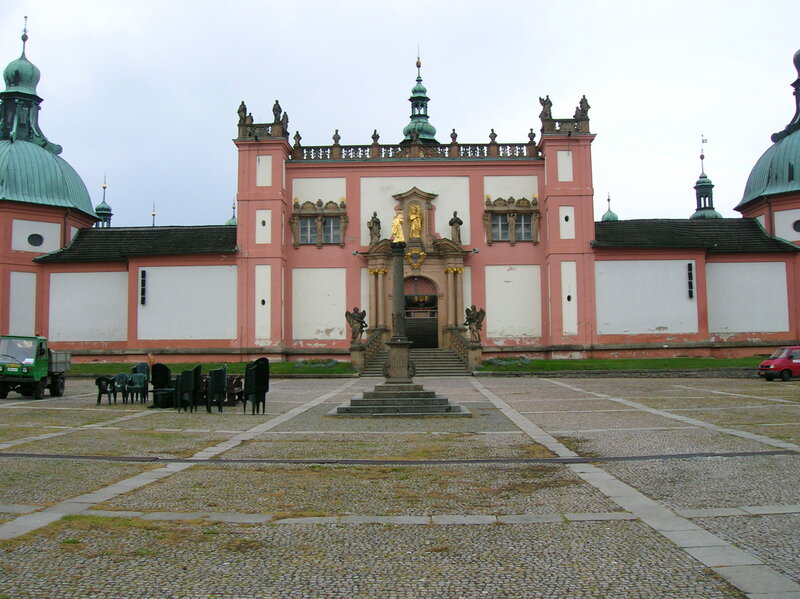 It hailed from 1667 with stucco adornment, paintings and a marble altar. Twelve paintings representing the 12 sections of the prayer “Ave Maria” caught my attention. 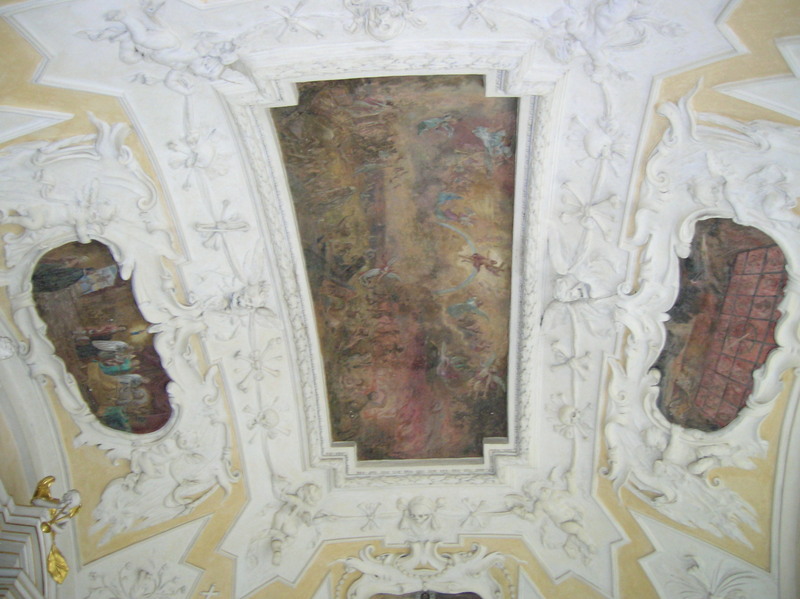 Czech saints, apostles, prophets from the Old Testament and archangels were gathered on the ceiling vault. On one side a painting showed the 1732 coronation ceremony of the statuette of the Holy Virgin of Holy Mountain. I wondered what it would have felt like to be at such a formal, lavish celebration during the 18th century. It must have been enthralling to see the figurine decked in golden armor. The ceremony still takes place once a year. 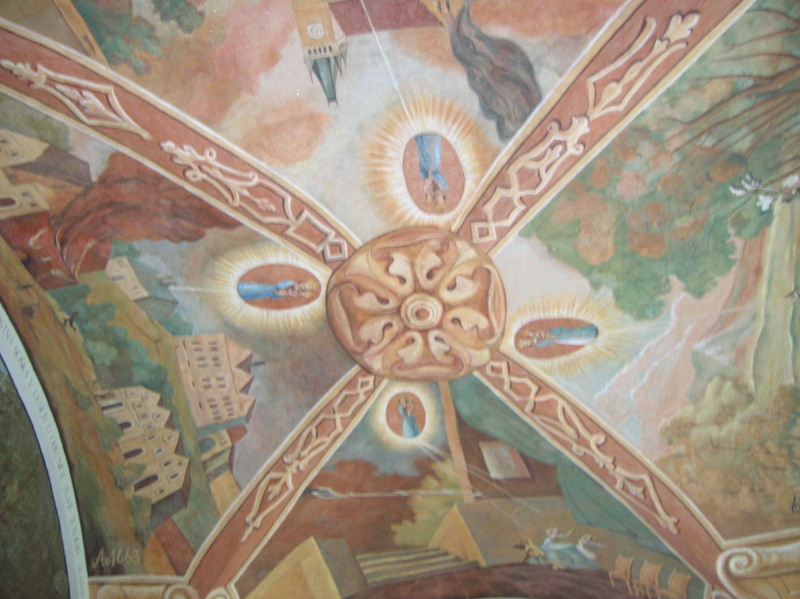 Impressive painting and stucco decorated the Chapel of Saint Joachim and Saint Ann. Paintings showed scenes from the life of the Holy Virgin’s parents. The Chapel of Saint Joseph, which hailed from 1667, featured the altar painting “The Death of Saint Joseph” from 1873. The interior was amazing. The Chapel of Saint Ignatius featured 10 paintings of scenes from the life of Saint Ignatius of Loyola. I noticed a coat-of-arms with a star and eagle and knew it stood for the Šternberk clan, who owned Šternberk Castle not far from Prague. That family had helped finance the building of this altar. 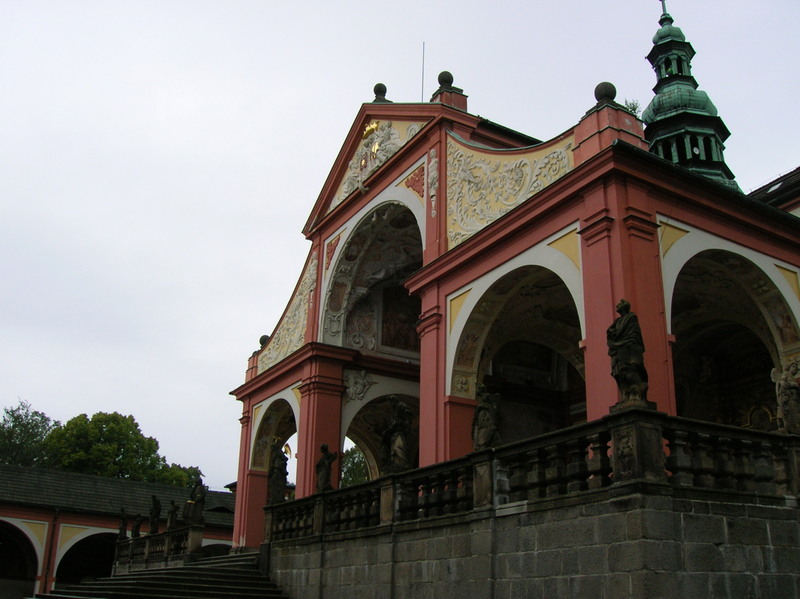 Another chapel called the Assumption of the Virgin or the Chapel of Saint Wenceslas featured exquisite stucco adornment and ceiling paintings from the life of Saint Wenceslas. Silver statues of saints also decorated the space. The Chapel of Saint Elizabeth had exquisite stucco decoration, and the ceiling painting featured Saint John the Baptist with his parents. The main altar was the big treat, though. Divided into tiers, it glittered silver. The statuette of the Holy Virgin looked so delicate inside the silver box. Silver figures of kneeling angels and Baroque reliefs added to the decoration. The antependium on the front of the altar could be traced back to 1686, and the tabernacle was constructed two years later. 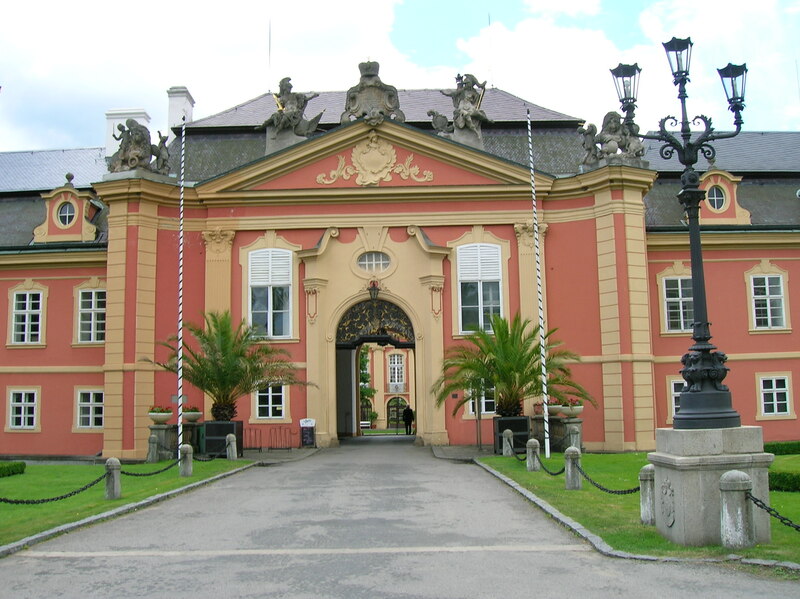 I went to check out the other entrance, the south Březnice Gate. Above the portal was a stone replica of the Holy Virgin of Holy Mountain. Six stone busts from 1707 included Mary Magdalene. The sculptural adornment was undoubtedly impressive. I said goodbye to the guide and descended the hidden staircase of more than 300 stairs that connected the complex with downtown Příbram. The Jesuits built it from 1727 to 1728 to protect pilgrims from bad weather. It was very austere, without decoration. After exiting the tunnel-like staircase, I walked down some picturesque, narrow streets with ceramic shops and small cafes. Then I came to the main square, where I found a restaurant that served my beloved chicken. After lunch I walked to the bus stop, and transportation to Prague came within five minutes.